Bearing the motif of the legendary Fire Bird, a mythical creature who rises from the ashes of its own funeral pyre, this pen is a real stunner. The flames cast in the tip give rise to the spreading wings of the Phoenix bird in the cap assembly, with the clip cast to resemble the bird's tail. Jewel crystals accent both the clip and cap. 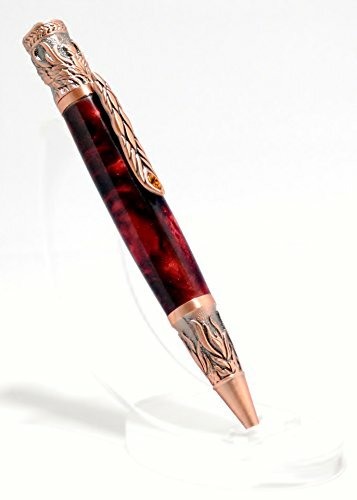 Handcrafted pens are perfect unique gifts for holidays, birthdays, anniversaries, promotions, and more! They are great eye-catchers and conversation starters, and provide inspiration and confidence. • Rhino brand acrylics offer a rich but subtle blend of colors in their materials. The homogenized mixtures create a striking depth and sheen for truly memorable pens. • Approximately 6 in. long and ½ in. diameter. • Fittings are copper plated. • Twist operation to extend/retract the writing tip. • Comes equipped with a black ballpoint cartridge. Uses Parker Style refills. • Ships in a brilliantly black-lacquered pen box, perfect for gifts or as a display case. All pens are designed, crafted, and assembled in beautiful Tempe, AZ by the sole owner and operator of a veteran-owned business. While the business is small, this allows each pen to receive full attention to detail. Only the best materials are selected and each pen is designed to show off the best character of the wood in the final product. **Note: Each pen is made by hand without the use of mechanical duplicators. Each piece of wood or man-made material used is completely unique. While every effort is made to provide a consistent product, please don't be surprised if your pen has slight variations in color, grain pattern, or shape from what is pictured. If you have any questions about this product by The Shapen Oar, contact us by completing and submitting the form below. If you are looking for a specif part number, please include it with your message.